This “small” turbine looks so simple, but the possibilities are actually tremendous. It is a hydrokinetic water mill; and as a company representative says, using just the natural flow of the stream, one this size generates 2.5% of the power of the larger hydroelectric dam site upon which it is housed. So without having to look at the numbers, we know that the magnitude is significant, considering the form factor. Imagine this thing on a micro scale – with a 18″ throat and a handle on top, not being held up by a crane like this one… As a self contained unit, it would be incredibly simple to pack into inaccessible areas and provide power to completely off the grid sites. Homesteaders would be able to rely on only ol’ man river for their power. Humanitarian groups would be able to have long and sustained presence in the most remote jungle or mountain areas, and because it is self-contained, it would be easily relocatable by explorers, etc who need the ability to both generate relatively large amounts of power and pack up and move overnight. Why so I see such potential here? It’s portable. It would work regardless of solar exposure. It harnesses a very elemental natural process. The sleek form and lack of moving parts mean that this is a reliable device. Simplicity and sturdiness are the most effective qualities in a “technology” that is successful under adverse circumstances. Just add water and the applications are limitless. And when I build my mountain compound (muahh ha ha ha ha!) hopefully I’ll have my own hydrokinetic water mill. One of my favorite phrases, but something I cannot offer you in this holiday season. Wish me swift typing fingers and a sharp design eye as I write my letters (pumped out 2,000 words yesterday) and completely redo my portfolio from the ground up. If you would like to check out my old portfolio before it is lost to the ages, go here. All my holiday love and respect to you and yours. Architecture is Dead (look for that post in the new year) but War is Over, If You Want It, too. Today is the best date to commemorate that I’ve ever had. After a decade of self-destructive slavery, I quit smoking one year ago today. My life is unrecognizable from what it was then. they lived for a decade or so. Highlighting the extremely fertile and meaningful cross pollination of the ideas above and more, Felicity D. Scott makes a powerful case against the previous disinclusion of Ant Farm from the canons of both art and architecture. For anyone interested in visionary architecture and art or in media commentary; if Ant Farm is not the definitive source of any ideas, they are worth reading and attempting to understand because they blended so many facets with such fruitful results. This book is a joy to read, and what you get out of it, you won’t find anywhere else. Edit: Here’s a sampling of the primary sources… Because the only thing better than classic cars and burning televisions is driving a detourned classic car through a wall of burning televisions. This is the first I’ve heard of the drawdio – and it is literally amazing. I’m sure people have done this before, the fundamentals of how it works are so incredibly simple: but the insight to put it out there, show some really innovative uses – to insert it into what is now a connected community of people making things worldwide, liberating technology in ways that no peoples soviet could have… The applications are literally endless. “…You’re right. The circuit is just a 555 timer in astable mode. I didn’t invent the circuit of course. Only thing I did was strap it onto a pencil and think about it differently. Imagine all the possibilities for this – from the most industrialized (weaponized even) to the most guerilla. From worker safety applications (if you hear the tone, you’re improperly grounded!) to a forest hooked up with them, becoming a symphony (well, cacophony really) when interacted with by a group. The soundtrack of an artist painting can become part of the artistic document, a soundtrack played in the gallery. Etcetera etcetera. It is a very simple feedback device, but it gives lines new dimension, and through the fact that human contact can complete a circuit – it can becomes a report of literal human interaction (touching) as well. I love when low technology means give awe inspiring results. Please comment, what do you think this should be used for? On the flip side of the tech coin, here’s an extremely complex computer controlled interface that it takes expertise to use, and the results are worth that extra level of complexity. And in a funny bit of synergy, it sort of works in the inverse of Drawdio. Another very important feature here is about making as simply putting something into the world, the “strap it onto a pencil and think about it differently” part – that is something really important we can do today. Anyone can, and everyone should take the tools already available to us and reuse them, detourn them, recombine them in surprising or unconventional ways that can provide us with information, feedback, and pleasure. Ways that could provide meanings juxtaposed against each other to strike contrasts and comparisons we’d have never seen without looking at old “data” and stimuli in new ways. Music of the circles, really. I distinctly remember this from my childhood – and it’s funny how much my interests are still right there, with my love of abstract visual and audio composition, amateur interest in descriptive geometry, etc. I didn’t have the language to understand why I loved it back then. What with being three and all – but it’s interesting that this was actually probably very formative and I haven’t thought about it in 20 years. So of course, I didn’t know the music was Philip Glass. While us D-rate bloggers are busy trying to convince ourselves the world that we have something to say, this is what a real adventurous mind is up to. From BLDGBLOG. Just read it already. I’m looking forward to the book. That’s the usual sendoff from my comrades over at Satellite Fiction, as it was in olden times on The Satellite Show. It is a tribute to the departed, culminating in the playing of the song of the same name by Styx. 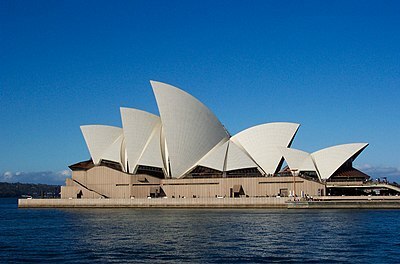 This time it’s a little more metaphorically appropriate, because the world has lost Jorn Utzon, architect of the Sydney Opera House, amongst many other notable but less famous pieces of iconic architecture. Goodbye, sir. You leave behind a large wake. For a lengthy and compelling consideration of this man, who deserves both, read here.